Here's another wave of news from the upcoming Ibiza season. It's been a while, so we have plenty of news on the quickly approaching summer of Ibiza 2019. As the party calendar continues to fill up, the energy levels keep on rising here on the island and beyond. Check out what else has been confirmed so far. Some of the island's most popular parties have announced their dates with a few early-bird deals, too. Daytime parties are taking centre stage at this point with a boat party ready to set sail and pool parties galore. To make sense of it all, start by checking out the overview of summer 2019. We have already passed the midway point of winter, and spring is right around the corner. Sounds like the best time to start thinking about summer to us. Dive in. Essential info on how to plan for next summer - not only for Ibiza virgins. Here's to some of your favourite dance floor moments last summer. The Benimussa Park staple returns for another season starting with super-early-bird tickets. The wild IBZ boat party is ready to set sail with some amazing early-bird deals. The exceptional duo return to "home of the pool party" for round two. The open-air tech house party signs on for third season at the home of the pool party. Mark Knight brings Toolroom Records to Eden for a full season residency. 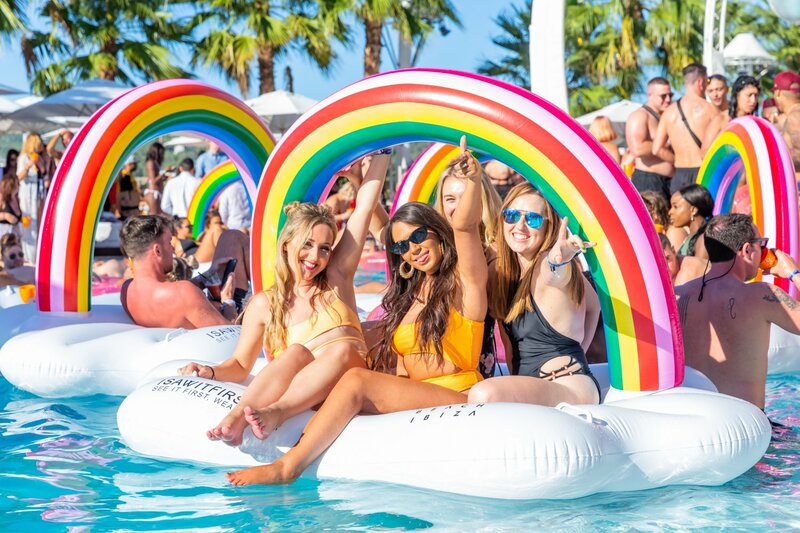 Get all your smash hit cravings satisfied during Ibiza 2019 at this pool party. The top-selling party announces the dates for Ibiza 2019. The grime star lands back at Ibiza Rocks Hotel for third year of urban bash in July. Here is all you need to know about the evolved beach club's residencies. That's it for now. For all your latest club news on the spot, head here. For full party listings, check out our party calendar. Sucht ihr eine schöne Urlaubsunterkunft? Copyright © 1999 - 2017 Ibiza Spotlight S.L. Alle Rechte vorbehalten. Diese Website gehört Ibiza Spotlight S.L., NIF: B57221541, Avinguda Doctor Fleming 35, 07820 Sant Antoni de Portmany, Balearen. Ibiza Spotlight ist im Handelsregister von Ibiza registriert, unter: "folio 44 del tomo 149 del archivo, libro 149, hoja número IB-3798, inscripción 1ª". Tel: (+34) 971 34 66 71 Kontakt. Wir sind eine nach spanischem Recht lizenzierte Reiseagentur, Lizenznummer AV-026-E.
Wir sind Mitglied von PIMEEF, einer Vereinigung kleinerer Unternehmen auf Ibiza und Formentera. Wir sind von der AVAT, einer Vereinigung von Urlaubsimmobilien auf Ibiza und Formentera, offziell als Agentur für die Vermietung von Urlaubsunterkünften zugelassen. Alle veröffentlichten Preise verstehen sich inklusive Mehrwertsteuer.